If your CEO asked about your progress moving to the cloud compared to other companies, would you know the answer? The "Benchmark Your Enterprise Cloud Adoption" report, published by Forrester Research, presents a wide-ranging look at strategies, priorities, and insights from infrastructure and technology leaders to help you assess and improve your cloud adoption initiatives. Make sure your cloud initiatives focus on the topics that are important to the people who are invested in their success, such as developers and business leaders. New performance metrics are required that align with business outcomes like speed, agility, flexibility, and autonomy, and tech leaders need to align themselves with that shift. Before starting your cloud development or migration initiatives, evaluate your portfolio to identify the services that are the best candidates in terms of effort and impact. Rethink success in terms of speed and consistency, time to market, and meeting customer needs. That means not only encouraging technology management teams to standardize and automate, but rewarding them when they succeed. Featuring peer-based benchmark survey data, this report will help you assess your company's move to the cloud, understand the approaches and priorities other tech leaders are using, and what should be at the top of your cloud priority list for 2017. 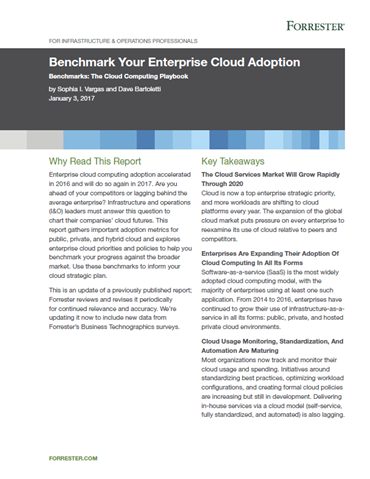 Download your complimentary copy of "Benchmark Your Enterprise Cloud Adoption."